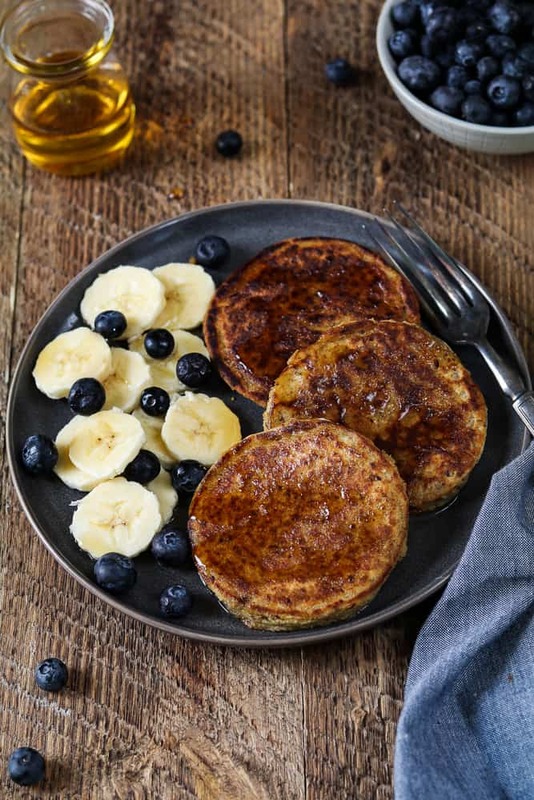 Nourish your mornings with these Healthy Vegan Protein Pancakes. They are fiber-rich, completely satisfying and packed with 15 grams of protein per serving. Today’s recipe is sponsored by Naked Nutrition. All opinions are my own. School days are almost here and it’s back to quick and easy breakfast recipes. Along with being fast, breakfast also needs to be hearty and satisfying. So to avoid hunger pangs, I feed my son filling meals like Quinoa Breakfast Bowls, Vegan Protein Pancakes or Tofu Scramble. Meals like this will give him the nourishment and energy he needs to take on the day. I’ve recently been making him pancakes with Naked Rice Protein Powder and he loves them. It doesn’t give the pancakes a weird aftertaste or gritty consistency. They turn out light and tender with perfectly crisped edges. I like brown rice protein powder because it’s easily digestible, hypo-allergenic, fast-absorbing, and it’s loaded with essential amino acids. Plus, It’s heart healthy and can help lower cholesterol, too. I love adding a boost to my morning smoothies. Now, you don’t have to reserve protein powder for just smoothies, you can add it to oatmeal, muffins, brownies, pizza crust, energy bites and these Vegan Protein Pancakes. The options are endless! You don’t need a bunch of additives to get your daily protein fix. 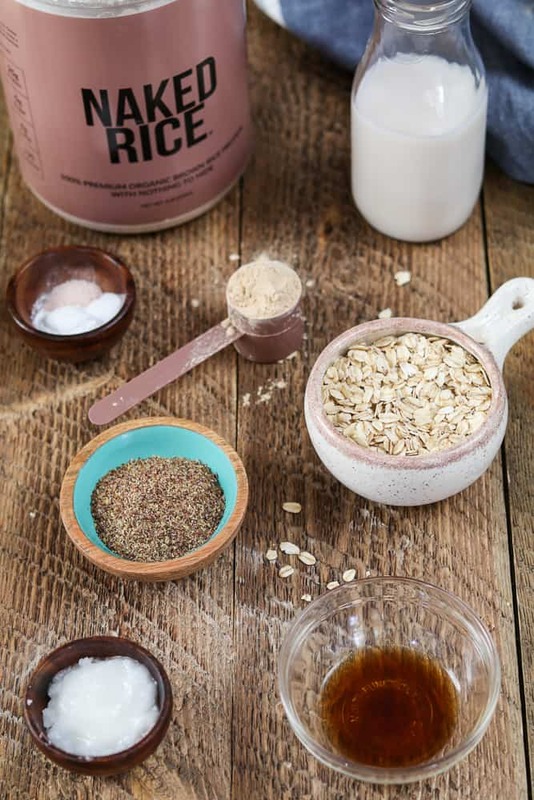 This Naked Rice Protein Powder is made with just one ingredient -Organic Sprouted Brown Rice Protein. That’s as pure as it gets! It’s completely free of artificial sweeteners, artificial flavors, and colors. Plus, it’s non-GMO, soy-free, melamine-free, and gluten-free, too. Oh, and it’s VEGAN!!! You’ll get a whopping 25 grams of plant protein per serving, along with an array of essential amino acids. Also, it contains only 120 calories per serving and 4 grams of carbohydrates. Nothing else! Hence the name ‘Naked’ Nutrition. Naked Rice is minimally processed using a hexane-free method. This method produces an exceptional amino acid profile to give you maximum benefits. Naked Nutrition is forthright with the products that they sell, too. They have everything third-party tested for heavy metals so you know what’s going in your body. 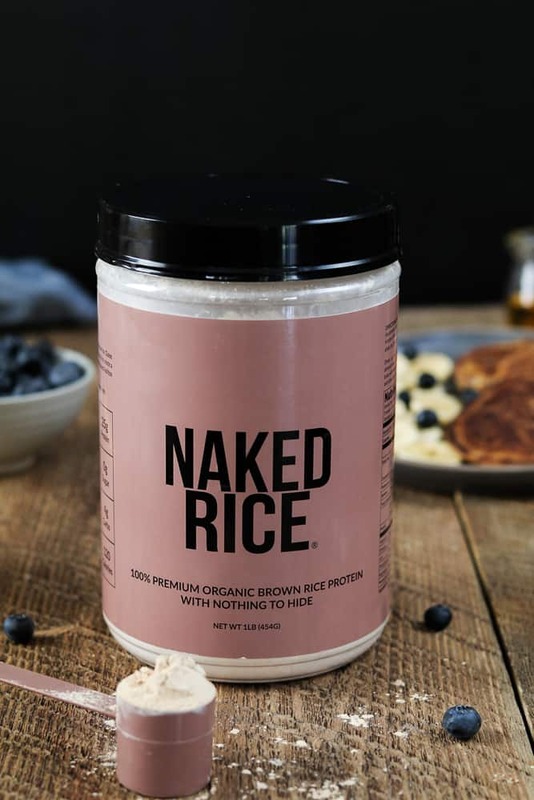 Naked Nutrition also makes a Pea Protein Powder that I’m really interested in trying out. Yep, just one ingredient, too! If you have an oil-free diet, feel free to leave out the vegan butter or coconut oil. They will still be delicious! You can use any plant-based milk that you like, too. I just use whatever I have on hand. This is the fun part! Load your pancakes up with nourishing toppings like fresh fruit, nuts, seeds, nut butter or granola. For a little extra sweetness, add a drizzle of pure maple syrup or a dollop of fresh coconut whipped cream. Or if you really want to go for it, add a half cup of vegan chocolate chips to the pancake batter. You won’t regret it! 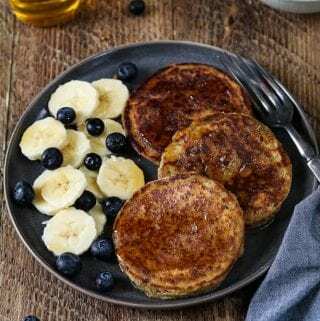 If you make these Vegan Protein Pancakes, let me know what you think by ★ star rating it and leaving a comment below. It would really make my day. You can also follow me on Instagram and share your creation with me. 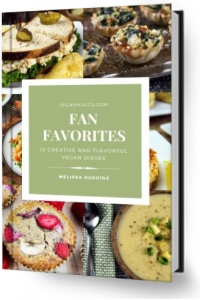 Just tag me @veganhuggs and hashtag #veganhuggs so I don’t miss it. Preheat oven to 200 ° F (93° C) - To keep cooked pancakes warm. Prepare flax eggs in a small bowl and set aside about 10 minutes. It will thicken up and become gel-like. In a large mixing bowl, add the oat flour, Naked Rice Protein Powder, baking powder, baking soda, and salt together. Whisk to combine well and set aside. To a medium bowl, add the prepared flax eggs, almond milk, melted butter, and vanilla. Whisk to combine well. Now slowly pour into the large bowl and whisk to combine well. Let the batter sit 1-2 minutes to thicken up. Heat a large non-stick skillet (or griddle) over medium heat for about 1-2 minutes. When pan is evenly heated, drizzle with oil and spread with a paper towel to coat evenly. Scoop a 1/4 cup of batter into the skillet to form pancake circles (they don't have to be perfectly shaped). I usually cook four at a time. Cook the pancakes until you notice tiny bubbles/holes form on the top and the edges are somewhat firm (about 1-2 minutes). Now flip your pancake and cook the other side about 1-2 minutes, until golden brown. Place cooked pancake on a baking sheet in the oven to keep warm. Repeat until all the batter is gone. Drizzle oil in the pan before placing fresh batter down. *If the pan gets too hot, it could burn the batter fast. Take the pan off the heat and let it cool for a minute before starting. Make sure to reheat pan evenly before adding fresh batter. You can also turn the heat down a notch. * If you don't have ground flax seed, just grind whole flax seeds in a coffee grinder. * Yields about 8-10 pancakes. When are you supposed to add the almond milk ? $75.00 dollars for a protein powder! That’s my whole weeks budget for groceries. Can you recommend another protein powder? Hi Denise, that’s for a 5 lb container. It’s huge! The one pictured in my post is a 1 lb container and it’s $22. It lasts me a while. Thanks for stopping by.